The great tree of the island has withered away, and with it the Goddess has vanished. It is up to you to revitalize the island, the Goddess, and return the massive tree back to it's original status. This is the first Harvest Moon game to use the Wii's tilt-sensitive controller. You can till your farm soil with a downward movement of the controller, and even water your plants by wiggling the Wiimote back and forth. You also have the ability to select what gender you want to play your character as. The village you live in is called Waffle Town, on Waffle island. Livestock animals are the typical Cows, Sheep, Goats, Ostriches, Ducks, Honey Bees, Silk Worms, and Chickens. There are wild animals as well, such as the typical Monkey, Turtle, and Weasel. New animals are the Bear, Panda, and Penguin. When you raise a wild animal to 6 hearts, it will move into your farm. Your child and spouse will help you with your farm work. Fishing is done by swinging the Wiimote up, down, then pressing A when the fish bites. You can cook the fish you catch with a fire. There are mini games like a 4 player horse race, bug catching, frog jump, carnival popgun targets, and wack-a-mole. 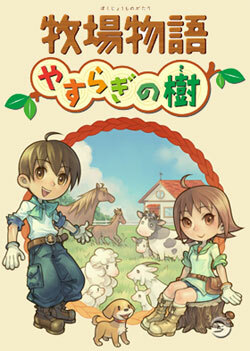 Tree of Tranquility was not made with the help of Igusa Matsuyama, the regular character designer for the Harvest Moon Series. Matsuyama-san latest projects were Island of Happiness, River King: Mystic Valley, and Shining Sun & Friends for DS. The game has sold approximately 65,000 copies in Japan in 2007, according to MediaCreate sales data.